Sunday seems a time to catch up on some significant rugby stories, mention some whispers heard here and there, and reflect on rugby in general. Meaghan Howat leaving RC seems a major story. She was listed as Director Rugby 7s Operations on the RC website and a lot of decisions around the 7s teams seemed to have to go through her. Her position was funded by OTP and it seems her position won't be posted or filled but some of her duties will be absorbed by other staff. She's off to the University of Guelph. She's spoken of highly for the heavy workload she carried. I only dealt with her on occasion when trying to get discussion on new ideas, that usually didn't go very far. Hopefully RC are moving towards being an open organization that entertains input from all segments of the Canadian rugby community. Speaking of new ideas or actually old ideas with possible new packaging. I hear RC are seriously entertaining bringing back some form of the Pacific Pride program. They're at the point of discussing with potential stakeholders at least. From my perspective having a national U23 development side playing in the BC Premier league again would be great and hopefully it would be focused on supporting the national U20 program. Currently most of our national U20 side comes from UBC and UVic, and the top Ontario Universities. The U20 players who don't have university in their plans are left on the outside, bringing the best to a central location to play as part of a program along with players in their early 20s would be a positive step. That leads into the next story about age-grade 7s. Canada are sending a team to perhaps the top global U18 7s tournament being held in Auckland, some of the players are over age but apparently that's permitted. Not sure if that's just for some teams or all teams? When we read the RC press release, first question is who is the coach, Nigel D'Acre. Apparently he's the founder of the Canadian Misfits, a touring 7s program that has had some success at the youth level. He's also the Ontario Junior 7s coach. If it's the same Nigel D'Acre, and how many can there be in rugby, he's also been capped for Hong Kong nine times in 97-98. Good luck to the team and if it's streamed we'll post the info. 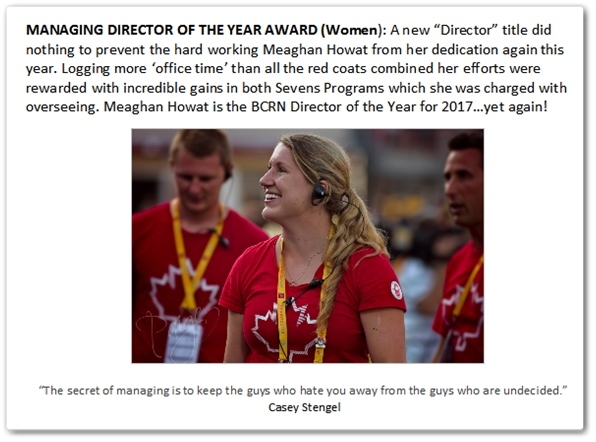 Also interesting to note the RC press release below quotes Meaghan Howat, "Rugby Canada’s Director, Rugby Sevens Operations" - soon to be old news. Guelph, Ont. (November 30, 2018) - The Guelph Gryphons Department of Athletics is pleased to announce that Meaghan Howat has been named the new Manager, Athlete Services of Gryphon Athletics. Meaghan is a former University of Guelph graduate who competed for both Rugby and Hockey teams as a Gryphon and was named the Department's Female Athlete of the Year in 2007. Howat joins the Gryphons after spending the last six years on the Leadership Team of Rugby Canada, most recently as the Director of Rugby Sevens Operations. She led several of the strategic athlete-services and high-performance functions at Rugby Canada and has been involved in all programming aspects from Olympic preparation, budgets, staffing, and reporting as well as pathway, and player development. As the Director of Rugby Seven's operations she honed her governance skills leading the program in quadrennial planning, overall operations as well as building the main sevens development academy in Ontario through the CSIO. "We're very excited to welcome Meaghan to our team, she has a comprehensive understanding of high-performance sports and managing teams," said Director of Athletics, Scott McRoberts. "Her commitment to excellence and drive to support coaches, athletes and support staff at the highest level will be a terrific fit within the Gryphon culture. Not only are we thrilled to have someone of her skillset join our team, it is even more special to have one of ours, athlete of the year, come back to help bring our program to the next level." While at Rugby Canada, she was the direct lead with the Canadian Olympic Committee for Pan Am and Olympic games preparation. Meaghan was the manager for three World Cups and the Rio Olympics where the women's sevens team won a bronze medal. She has worked with many other parts of the organization including the women's 15s program in their 2017 World Cup campaign as well as FISU and age-grade national teams. "I am extremely grateful for this tremendous opportunity and am thrilled to be coming back to the University of Guelph." Howat said. "I'm passionate about working with and supporting athletes and coaches from grassroots to a pinnacle event. This is an exciting time for athletics at Guelph and I look forward to working with the entire UofG community and continuing to build on the current varsity success and outstanding Gryphon culture." A native of Toronto, Ont. Meaghan holds a B.A. in Bio-Chemistry from the University of Guelph where she was a two-sport athlete in hockey and rugby. She was named a two-time CIS Rugby All-Canadian in 2005 and 2007 and the Female Athlete of the Year in 2007. After graduating from UofG in 2011 she went on and earned her MBA from Notre Dame University in South Bend, IN. She sits on the Champions Fund Committee, Fueling Women's Champions and has been a member of the Ernst and Young Women Athletes Business Mentoring Program. Howat will officially begin her role on December 17. Head Coach Nigel D’Acre has selected the 12 players that will represent Canada at the 2018 U18 World School Sevens tournament in Auckland, New Zealand, December 14-15th, 2018. In the two-day tournament Canada will face off against teams from rugby nations like New Zealand, Tonga, Australia, and Fiji who set the international standard of play. “The World School Sevens in Auckland provides an amazing opportunity for our up-and-coming athletes to gain valuable experience against some of the worlds best national youth programs,” Said head coach Nigel D’Acre. While many of the players are seasoned in domestic play, the annual tournament is a crucial point of development for the young athlete’s skills in international competition. “I think it’s important that we get to test ourselves against the top international competition. This helps us develop our pathways from academies, provincial, and domestic competition through to international experience.” Said Meaghan Howat, Rugby Canada’s Director, Rugby Sevens Operations.